Can I drop my package into one of those USPS mail collection boxes? We all know that placing an envelope or letter with a stamp into a the USPS’s blue mailboxes on the corner will ultimately get it to it’s destination. Well, unless you’re unlucky enough to be on this postal carrier’s route. For the remaining 99.99999999999% of us, those blue boxes work quite well despite our complaints about the United States Postal Service. I’ve used these boxes periodically for decades and never had a problem. I also never thought that I could use them for anything outside of what can fit into an regular-sized envelopes. Can I drop off my package in USPS mail box? Not until recently did I think about dropping a package into those mail bins when I had an Amazon return with pre-paid postage that wasn’t being picked up by my mail carrier (Amazon told me to put into my mailbox). The package sat in my mailbox for days. Not sure why they didn’t pick it up, but it wasn’t worth thinking about too much. Then it hit me: why not put it into an USPS mail collection box around the corner? The package was definitely small enough to fit, it was addressed properly, and had the correct postage, so why not? Up to that point, I never put any of my packages into those mail boxes, so am I allowed to drop off my package in one of those public USPS mail box? The answer is yes. 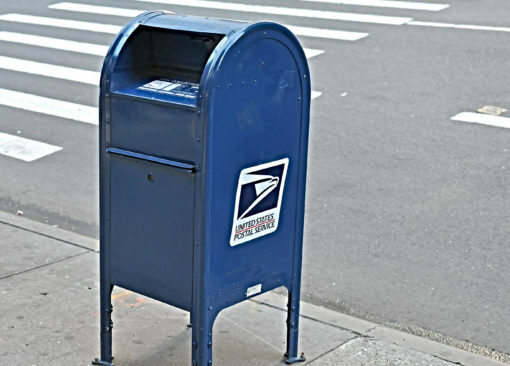 The U.S. post office allows consumers to drop packages into the blue mailboxes as long as they can fit and have the correct postage – whether that’s by stamps, or postage printed out from Amazon, Stamps.com or Paypal). Knowing this makes things so much easier, but there’s one caveat, packages can’t exceed a certain weight (I’ve read 13 ounces and 14 ounces). So outside of having your mail person pick up USPS paid orders from your mailbox or home, or physically walking to the local post office, you can drop the package in a USPS blue mailbox. And this Amazon seller says that she filled up two mailboxes every morning. I fill 2 mailboxes with packages every morning. You can sometimes shake them to fit more in. My personal experience and the experience of a few people online has indicated that when sending this route, it’s taken longer for the package to get into the system. Usually a day or two afterwards, so if you’re in a rush where every day counts, dropping your package at a USPS Collection Box might not be a good idea. Outside of large boxes, packages over 13 or 14 ounces, and time-sensitive parcels, you can drop your postage-paid packages into an USPS Mailbox. Find one near you.